What struck me, when I re-read the book (in a single day because it was that compelling and I could not put it down) wasn’t Johnny Nolan’s ode to unions as much as it was his description of the workplace. Johnny works in the 1910s version of the gig economy, picking up singing waiter jobs when they’re available—he never appears to be offered a full-time position with set shifts—and the idea that your employer might get a cut of your earnings, simply by virtue of providing the framework through which you can perform your occasional trade, is an awfully familiar one. Johnny’s wife Katie also “freelances” as a janitor, a common enough occupation for women in the early 1900s, and one where she is expected to provide her own supplies and hustle for her own clients. This advice comes to Katie Nolan from her mother, Mary Rommely. Mary had a star bank, and she saved up for her piece of land and bought it—or thought she did, because she could not read the fake contract the swindler had her sign. That’s why Mary ensures her daughter not only knows about saving money, but also knows how to read. Which brings us to one of the third Big Lessons: the importance of education, especially as a tool to ensure you don’t lose money. It’s fascinating how the Nolans, in a book published in 1943 about life at the turn of the 20th century, lie about their home address so their daughter can get into a better public school. This stuff has been going on for a long time, y’all. But Francie gets her education. She eventually goes to college. Meanwhile the star bank is saved into and withdrawn from, over and over again, until the Nolans have their piece of land: the cemetery plot in which they bury Johnny. That’s another one of the book’s lessons, although it isn’t stated as emphatically as the other ones. Katie Nolan can read. Her children have more education than she does. They still lose all of their savings to an unscrupulous undertaker who preys on the poor. Katie is aware of what is happening even as the man explains how much money it will cost to bury Johnny, and she is powerless to stop it. This is how her life has always been: she earns and saves and a landlord tells her the family has to move, or an undertaker says the funeral package they purchased doesn’t include the cemetery plot, and all of her savings disappear. Katie hopes that her children’s lives will be different, and so we follow much of the story through Francie Nolan’s eyes, watching her grow up and excel in school—except for the one English class where her teacher asks her to stop writing about poverty because “We all admit these things exist. But one doesn’t write about them.” We see Francie, after her father’s death, drop out of high school and enter the workforce, where she also excels. She gets better jobs than were ever available to her parents or grandparents. She works in offices, has set hours, and gets promotions. She also gets laid off as each of her employers cuts back or shuts down. Once again: this stuff has been going on for a long time, y’all. Francie continues to work and begins taking college classes (she writes “privately educated” on the forms so she does not have to reveal her lack of high school diploma). At the end of the book, she’s passed the entrance exams required to enroll full-time at the University of Michigan. We’re meant to understand that education does in fact lead to… well, if not quite constant success, then hope. Possibility. 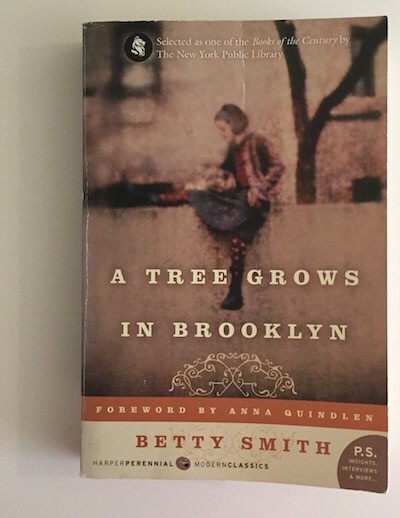 If you’ve read A Tree Grows in Brooklyn, what parts stand out in your memory? I could keep going, writing about the job that gives Francie a week of paid training (because WHO DOES THAT ANYMORE? ), or the scene where Francie accidentally negotiates a raise from a boss who wants to underpay her, but I’ll stop here and turn the discussion over to all of you. After all, this novel is so complex that even analyzing the money and workplace aspects doesn’t begin to cover half of the story. Next week: The Return of the Great Brain.